There's a pan-global feel to Christopher Campbell's music that might be familiar to any time-traveler racking up the frequent flyer miles. Bowed koto and Fender Rhodes piano are as likely to make an appearance as a pseudo-Scottish patriotic song or the sound of a sparrow colony in the shrubbery near his house. It's altogether a luscious organic ritual that transcends studio, concert hall, epoch and continent; American Gagaku for the space age. Sound the All-Clear is the first album by composer/film-maker Campbell and his visual sense bleeds through every imaginary sound-space. The 'all-clear' is a traditional signal in time of strife or tempest that the danger has passed and peace has returned to the land. The music on these 12 tracks seems to breathe post-apocalyptic relief as it cycles and settles, expands and contracts. The unlikely ensemble brought together for the project features a dozen top pros (such as Todd Hammes, Susie Ibarra, Michelle Kinney and others) and enthusiastic friends happy to sing, fidget and groove to realize Campbell's cunningly-contrapuntal, architecturally-planned score. With its audiophile production quality every tinkle, chime and plunk sounds golden. Christopher Campbell studied composition and film at Sarah Lawrence College and his teachers have included George Tsontakis and David Del Tredici. His music hits the Reboot button on classical music. He works at a record label in St. Paul. ... Though the album title signals the return of safety and peace following threat or danger, there's no modicum of turbulence about the album's content. In other words, Sound the All-Clear is not an exercise in ambient tranquility. Instead, it catalogues the composer's teeming and restless imagination, and documents an unpredictable and mercurial sound world that's hard to pin down and affix names to. 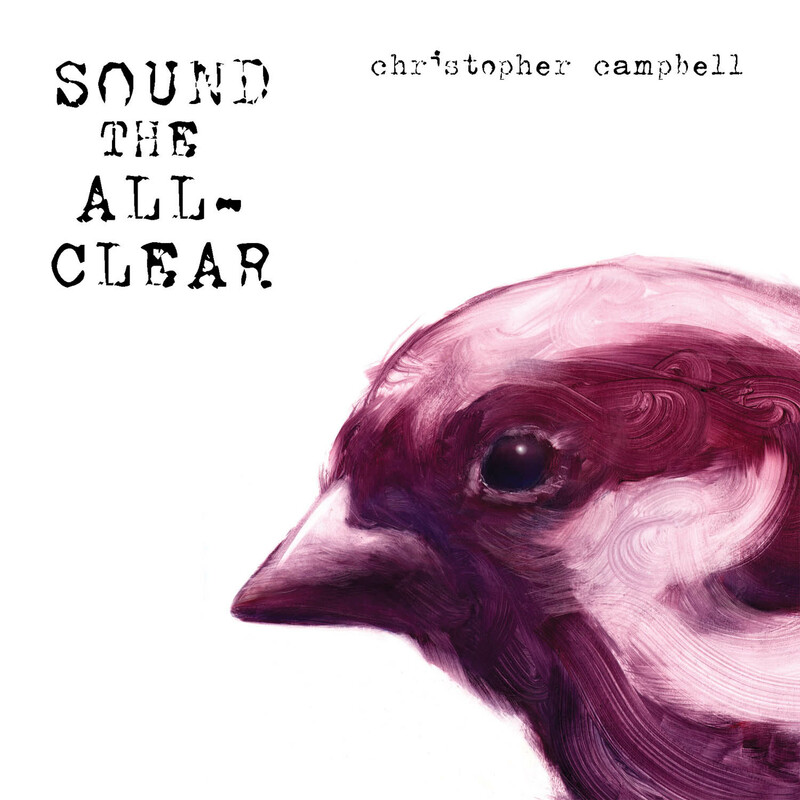 Sound the All-Clear clearly exemplifies an openness on Campbell's part to all sonic possibilities. [H]ere comes a guy ... who is willing to flaunt all the rules and pursue his own brand of highly idiosyncratic sonic mischief. There's something very whimsical about Sound the All-Clear, both populist and cerebral. The suite is carefully crafted with a real attention to audio detail, yet it manages to give the appearance of something tossed off, accidental. The ensemble beautifully marries the austerity of Gagaku with a uniquely Midwestern sense of wonder at the universe, transforming the traditions of Japanese court music into the music-box delicacy of Campbell's soundworld, a fragile architecture of rattling percussion, aching strings and warm mouth organ tones. Something in Sound the All-Clear definitely has the potential for crossover success; the vocals on "All Clear (1, 2, 3, 4, 5)" even bring to mind some of The Books' music, only less precious, more likely to linger in the mind for days to come. Christopher Campbell’s Sound the All-Clear starts off with an amusing trompe l’oeil effect for the ear—-a choral folksong seemingly taken from a beat-up LP complete with surface noise and even a needle stuck in the groove. Next comes a droning squeeze-box overlaid with noisy mechanical squeaking and twitters, then a tessellation of jangling strings, long-held chimes, boinking glissandos, low sustained piano notes, and one lonely human cry marooned above the aboriginal landscape. And on it goes, like an aural Quay Brothers movie or a Guy Maddin soundtrack--one jerry-built mechanism or electronic birdsong or tribal ceremony after another, meandering along, sometimes by itself and sometimes cunningly layered, until gradually, or suddenly, replaced by another. Annotator (and Campbell’s teacher) George Tsontakis describes the work as a movie-like sequence of “sound poems” distilled from “blended essences”, which is probably a fancy way of saying it’s a sonic collage. Collage, however well it mimics the play of mind and memory, isn’t the kind of thing I usually enjoy. I’m not sure it even fits my definition of music. It seems too arbitrary, too easy, too detached, at once too silly and too arty. But dang if Campbell (who is also a film-maker) doesn’t somehow manage to keep the proceedings not only interesting, but suspenseful. What will come next, the listener keeps wondering, and what does come next is, miraculously, never disappointing. Sound sources--some modified into drones, some rattling along as looped ostinatos, some distorted or cut-and-pasted--include voices, piano, electric piano, music boxes, sheng, prepared koto, strings, electric guitar, PVC flutes, balloon bassoons, Aeolian harps, toys, and lithophones (whatever they are), and who knows what else. Each is presented with exceptional clarity; even the more involved sections seem uncluttered and airy. And despite so much timbral variety the mood is sustained and consistent: droll, cheery, gentle, wistful. As the title suggests: the danger is past. Let’s take a stroll, whether down memory lane or across the meadow. The whole world beckons, and we’re free to ramble as we will. Chris Campbell’s Sound the All-Clear is less a piece of music than an imaginary movie for the ear. Rickety mechanisms, synthetic pastoral scenes with twittering birdsong, tribal ceremonies, and every sort of looping, whistling, scraping, droning, slithering, rattling string or wind or percussion or electric instrument you can think of, along with a few you can’t ... are concatenated into a sound-poem that even when densely layered ... never seems cluttered, and somehow adds up to much more than a mere sonic collage. Rather it creates a simulacrum of the play of mind and memory--and suggests an ancient, mythic story, too. A droll, wistful, cheery, happiness-inducing story of the creatures of this earth celebrating (as the title suggests) their escape, however temporary, from danger. With the plunk of a turntable needle a chorus culled from history sings, getting stuck in a scratched record groove that is overtaken by the breathy wheeze of an ancient accordion. Thus begins this through-composed, informed work from composer Christoper Campbell, collaborating with a large group of talented multi-instrumentalists. Through 12 movements, many described in the liner notes in scene descriptions or like passages from the I Ching, Campbell takes the listener on a journey that melds modern sound experimentation with traditional compositional techniques, contemporary and archaic, making reference to Western and Eastern musics and a great deal in between. The orchestration is far reaching and eclectic, integrating acoustic performance using conventional and historic instrumentats alongside electronics and sampling. Campbell blends modern and arcane approaches from a variety of disciplines, formal and intuitive, which he co-opts and/or corrupts so that familiar sections morph into unexpected territory in elusive and surprising ways. An idle listener may find themselves lost, but attentive listening encounters a journey through a broadly encompassing sound world that will bring a sly chuckle to experienced ears. The album slips out its ideas, lulling one into complacency with a seemingly meandering interlude, then presenting a concrete passage - melodic, thematic, conceptual, rhythmic - before fading into the surroundings to again ruminate. There is a poetic sense to the works, never stuffy and certainly never predictable, paced in pensive ways that bring together an abundance of impressions, like a peaceful and oddly ornamented garden occasionally disturbed by an inquisitive bird drawing your attention. The effect is something like looking through a camera lens and changing the focus slowly from foreground to background as each image blurs and sharpens, though using geometrical axes of genre, location and era to create a three dimensional and mesmerizing continuity of sonic images.